I’m not used to seeing the forced sacrifice effect on a red card . . . but I kind of like it, to be entirely honest. Colors should occasionally get a keyword or ability outside of their “core” part of the color pie if it really makes sense for them to do so. 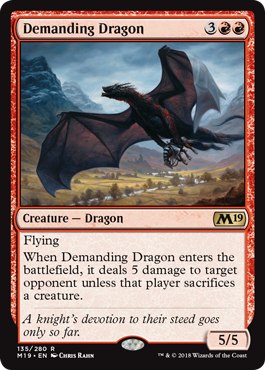 As for Demanding Dragon more generally, he’s technically a “punisher” effect, the kind of thing that competitive Magic tends to write off because it gives the opponent a choice. I think he’s a little better than that characterization makes him sound, though – regardless of which option your opponent chooses, they’ll still have to deal with a 5/5, and against creatureless or creature-light decks, that nearly unstoppable five damage will hurriedly change their calculation of how much time they have left. Mister Biggles demands tribute. It’s even in its name. A 5/5 with flying for 5 mana is about what you’d hope for in red, so that’s auspicious! The next question is if it’s worth it: a Lava Axe to an opponent’s face unless they sacrifice a creature. This probably is the most effective if you’re casting this into an opponent with no creatures, as you know what you’re getting (5 damage to the faaaaace) as opposed to them choosing what hurts least. Regardless, a 5/5 that can either blast them in the face or remove a creature on the same card is still quite efficient; that you’re not able to choose which does hurt, but it being a sacrifice trigger means that you duck around pesky things like indestructible and protection from red. There are times where Demanding Dragon can backfire, but a 5/5 stapled to a Lava Axe is good, as is a removal spell stapled to it. That you don’t get to choose which you get is irksome, but no card is perfect.